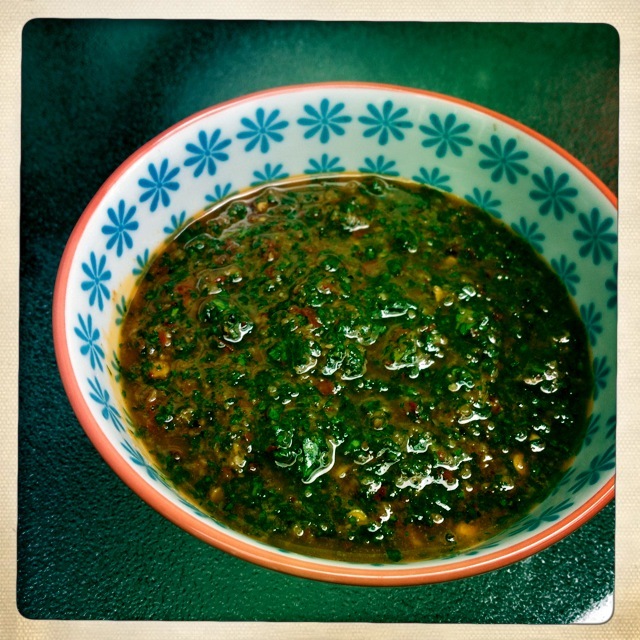 I learned to make the most amazing guajillo chili sauce at a cooking class at Altamira Restaurant in Tulum, Mexico. Chef Eric Fischer showed us how to make this, and we tasted it with shrimp tacos and nopal cactus empanadas. I recently served it with Mexican barbecued chicken, rice and beans, and it was awesome. The chef said it is also great if you spread it on chicken and bake it, or on seafoods such as shrimp, squid, mussels or scallops, and then serve it on pasta. 1. Heat the olive oil in a frying pan, then add the garlic. Move the garlic around so it doesn’t burn, and add a big pinch each of salt and pepper. When it starts to just get brown around the edges, add the wine. Add the chili strips – I removed the seeds from one pepper, and it was medium- hot, so you can add more or less of the seeds depending on your heat tolerance. Let this simmer for a few minutes. 2. Remove from the heat and put it in a blender with the parsley, or use an immersion blender, as I did. Taste and see if you think it needs more salt. This should be kept refrigerated until you plan to use it, and should last a week if not more in the fridge.